Today we’ll show you, how to install LiteCart on Ubuntu 16.04. LiteCart is a free and open source e-commerce platform which is developed in PHP, jQuery and HTML 5. In this tutorial, we will show how to install LiteCart on Ubuntu 16.04 VPS and setup a LAMP stack (Linux, Apache, MySQL, PHP) if you already haven’t. Installing LiteCart on Ubuntu 16.04 is fairly easy task and should take less then 15 minutes. Make sure to replace “PASSWORD” with an actual, strong password. Now that our LAMP server is ready, we can finally install LiteCart. That’s it. You can now go to http://yourdomain.com (or http://YOUR_IP_ADDRESS) and follow the on-screen instructions to complete the LiteCart installation. 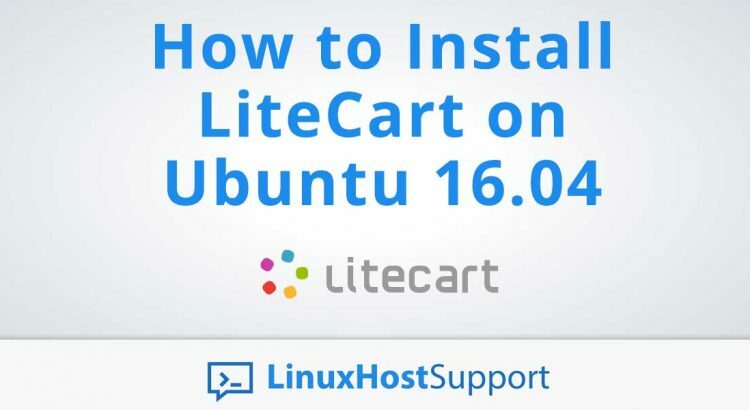 Of course, you don’t have to install LiteCart on Ubuntu 16.04, if you use one of our outsourced Linux server support, in which case you can simply ask our expert Linux admins to install LiteCart on Ubuntu 16.04, for you. They are available 24×7 and will take care of your request immediately. PS. If you liked this post on how to install LiteCart on Ubuntu 16.04, please share it with your friends on the social networks using the buttons on the left or simply leave a reply below. Thanks.